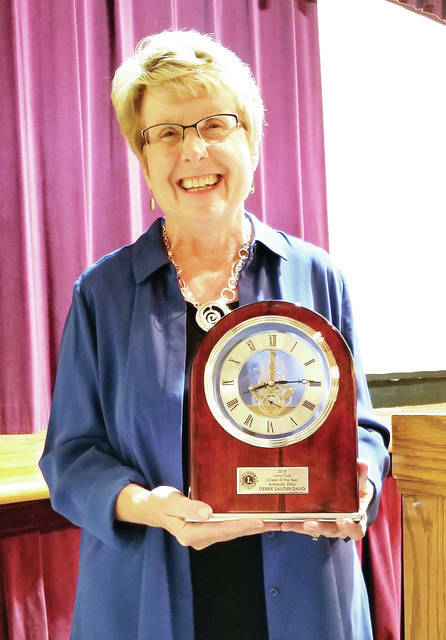 The Archbold Area Chamber of Commerce recognized Debbie Sauder David as the 2018 Archbold Citizen of the Year at its annual membership banquet Nov. 1. John Poulson, Lions Club president, presented the award to David at the banquet held in Founder’s Hall at Sauder Village. David currently serves as president and CEO of Sauder Village. The village staff is comprised of 450 full- and part-time employees, as well as 450 adult and youth volunteers. Prior to her return to northwest Ohio in 2000, David was a speech-language pathologist, specializing in brain injury rehabilitation. She served 20 years in healthcare settings in California, Texas, and Ohio. She was selected as one of five health professionals to serve on the first Texas Traumatic Brain Injury Advisory Board. She currently serves on the board of directors for Sauder Woodworking Company. David served three years as board chair for Mennonite Economic Development Associates, and served on their board from 2007-15. She was a past board member of Anabaptist Mennonite Biblical Seminary, is president and founding board member of the Friends of Goll Homestead, and has been a member of the Archbold Rotary Club since 2001. David also served on the board of WGTE Public Media from 2001-13, and was a member of the steering committee that developed the Free Clinic of Fulton County in 2006. She was board president of the Archbold Area Chamber of Commerce in 2007, and continues to serve as a member of the Economic Development Committee and Community Improvement Corporation. She is also a member of the Toledo Area Cultural Leaders. She was honored by the Girl Scouts of Western Ohio as a Woman of Distinction in 2015, and currently serves on the board of the Toledo Symphony and Toledo Ballet.